Trinity Rep Begins 2012 With "Merchant of Venice"
Trinity Repertory Theatre in Providence continues its 2011-2012 Season with "The Merchant of Venice," William Shakespeare’s incendiary indictment of prejudice. At the mercy of moneylender Shylock, Antonio must find a way out of losing collateral he simply can’t afford to part with -- a pound of his own flesh. A bold new setting brings to bear the timelessness of Shakespeare’s controversial play. Directed by Artistic Director Curt Columbus, the production runs February 3 - March 11 in the Chace Theater. Columbus said his interest was piqued not only by the complex character of Shylock (played in this production by company member Stephen Berenson), but by the intrigue afforded by the intersecting love stories. He commented, “This came into focus as a play about how people who hide their secrets need to alienate one another more, make them more ‘other’,” alluding to the nature of the relationship between powerful merchant Antonio (Joe Wilson Jr.) and his handsome young friend, Bassanio (Stephen Thorne). While Bassanio’s stated intention is to woo Portia (Brown/Trinity Rep actor Mary C. Davis), Columbus feels there is more to the story that Bassanio’s interests are part of a larger love triangle involving feelings for Antonio. The drama of the predatory lending arrangement with Shylock runs parallel to this. When Bassanio finally secures the money he needs to travel towards his intended from Shylock, Antonio is named as the loan’s guarantor. Shylock’s animosity for Antonio runs deep: Antonio is a professed anti-Semite who undermines Shylock’s livelihood with zero-interest loans of his own. Shylock pounces on the opportunity to return the favor to Antonio: If he is unable to repay the loan, Shylock may take a pound of Antonio’s flesh (and presumably, his life in the process). Portia is in the midst of her own devil’s bargain with her father. His will stipulates a cruel game of chance for the fate of her suitors and ultimately, her happiness. Although the play remains a problematic one the portrait of Shylock throughout history has not always been kind Columbus and Berenson take care to point out the complex dramatic reality of the play’s flawed anti-hero. "The Merchant of Venice" also features resident acting company members Fred Sullivan Jr. as Gratiano, a friend to Antonio and Bassanio; Rachael Warren as Nerissa, Portia’s maid; and Brown/Trinity Rep MFA actors Will Austin as Lorenzo, a friend of Antonio and Bassanio whose heart belongs to Shylock’s daughter; Darien Battle as Launcelot Gobbo (and others), servant to Shylock; and Caroline Kaplan as Jessica, Shylock’s daughter, who converts to Christianity, raising his ire. 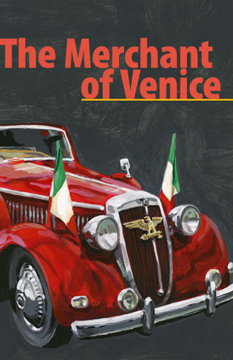 Columbus has enlisted resident designer Eugene Lee to construct the setting for his vision of "Merchant," which takes place in early-1930s Italy during a time of festival and celebration. Columbus says that audiences will have a vibrant, stimulating carnival-esque environment within which to watch this story unfold. The colorful celebrations of Venice, studded with song and rich costumes, eventually spin out into garishness as Shakespeare’s tale takes a darker turn when Shylock comes to collect what is owed to him. The show's first performance on February 3 at 7:30 p.m. is Pay What You Can (PWYC). PWYC tickets go on sale at 6:30 p.m., with a limit of one ticket per person. Talkback sessions will be held following every performance of "The Merchant of Venice." Audiences are invited to share their response to the play for approximately twenty minutes. For information and tickets, stop by the box office at 201 Washington Street in Providence, call 401-351-4242; or visit www.trinityrep.com.